A short brag on my frugal husband! He spotted turkey burgers and chicken tenders reduced for quick sale, grilled them and packaged them into sandwiches for every day this week! God really spoiled me with this guy! You're right, you are lucky and no doubt he feels the exact same about you! My husband is a very generous guy but pretty clueless in the frugal dept.--he can select, pay for and bring home a receipt without knowing the price of a single item, much less if it was a good deal, lol. 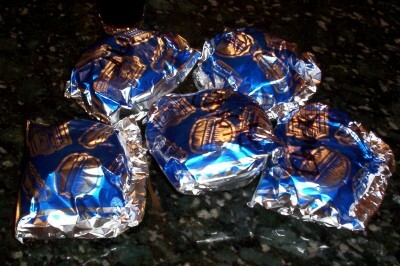 Are those the foil sandwich bags that burger places use? I've seen them at Smart & Final but never figured out a use. Can you reheat in them?